Learning from our Iceberg Lake experience, we started our hike the next day to Grinnell Glacier in the afternoon to avoid the morning crowds. This is probably the craziest hike I've ever been on. The trail begins by following glacial lakes, then ascends dramatically along a cliffside, speckled with wildflower and mini waterfalls, overlooking the entire valley. We saw ran into birds and ground squirrels the whole way, but then right before we reached the top we got a real wildlife encounter. They were right there in the trail!! After a 2500 ft climb, we reached the treasure waiting at the end: Grinnell Glacier. I've never even seen a Glacier before! The sight filled me with wonder and sadness. Glaciers are made when snow falls quicker than it can melt, packing into hard, permanent ice formations that stay frozen throughout the summer and provide fresh water to the valleys as their edges slowly melt. The lush valleys depend on the glacier melts for summer growth because there's hardly any rain here in the warm season. So when you look at Grinnell Glacier now and see that only a 40% of it remains compared to 50 years ago, you get sad. 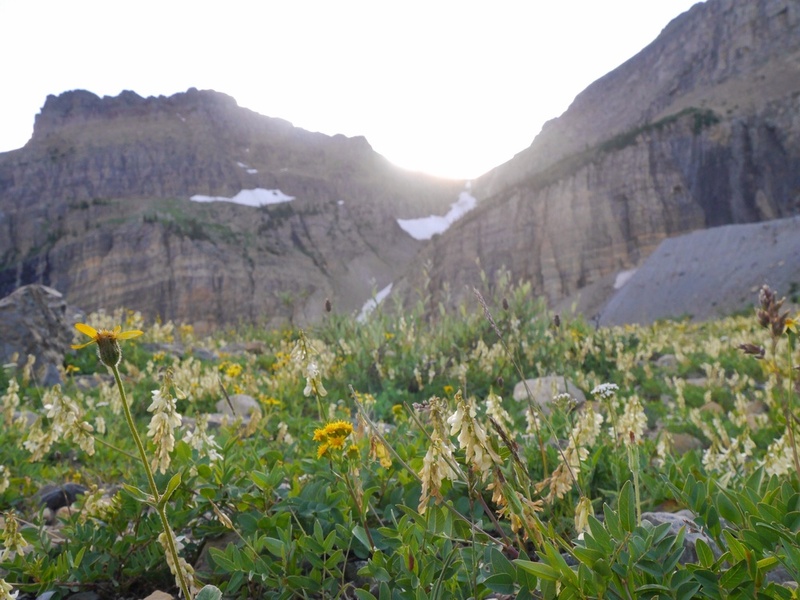 You realize that the streams that the glacier melt feeds will just get lower and lower every year, leading to drier vegetation, resulting in smaller huckleberry yields and hungrier bears. That the landscape will slowly become more and more of a tinderbox and devastating wildfires will become the norm. Probably the saddest thing is realizing that the same people who are actively campaigning against climate change legislation are becoming disgustingly rich by plundering oil and gas reserves, and claiming melting glaciers are not irrefutable proof of climate change but liberal propaganda. I felt lucky to see what's left of Grinnell because scientists predict that by 2030 none of the glaciers in this park will remain. It's even on the FAQs posting outside the ranger station. 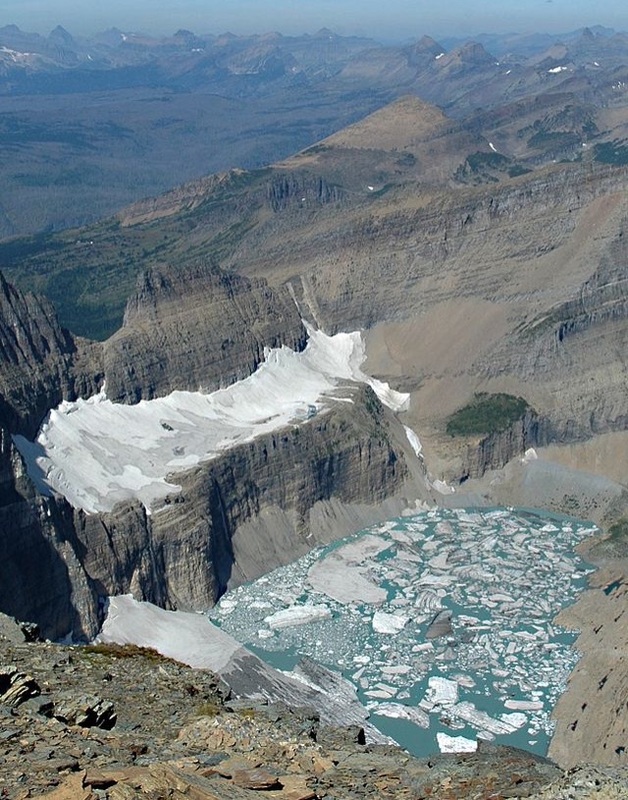 Q: What will Many Glacier be called after all the glaciers have melted? A: Many Bear. Even though these vacations that Travis and I take might be fiscally irresponsible for people who make so little money, we're reminded over and over again that it's worth it to travel NOW while we still can, for many reasons. People remind us over and over again that responsibilities can prevent you from taking a month off, and aging bodies can dramatically change the nature of the trip you take. But we're also realizing that we need to see these wild places while they're still here, before climate change destroys the conditions that allow these ecosystems to exist in the first place. As we rode out of Many Glacier to continue our journey, we saw a line of cars stopped dead in the road, and looked up at the cliffside. Grizzly Tour was living up to its name. 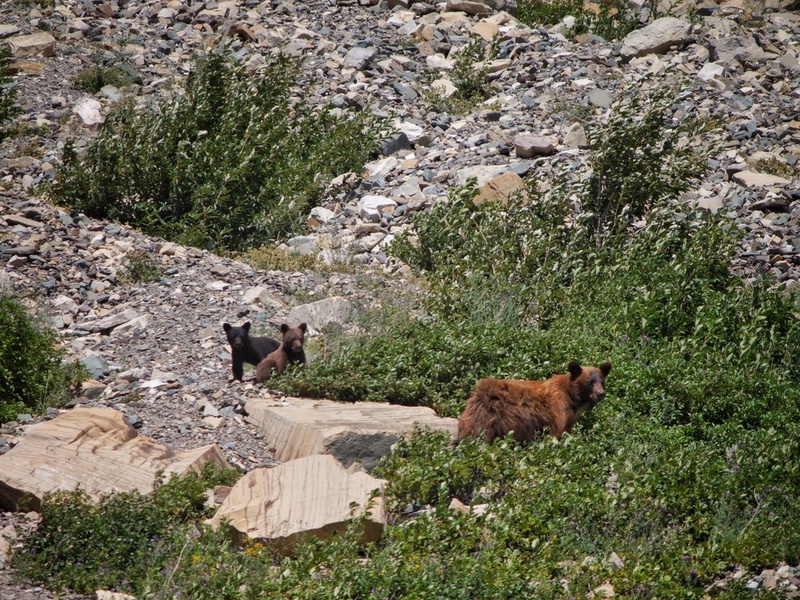 I've never seen a bear in the wild before, much less a Mama and two babies. 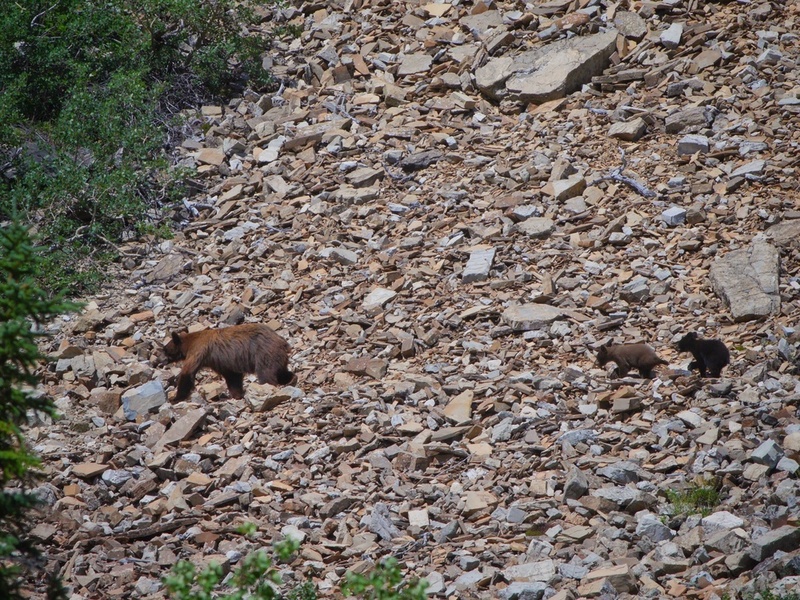 The cubs followed her from huckleberry bush to huckleberry bush, employing themselves with the important work of fattening up for winter. And I'm sorry if this is a wussy East Coast thing, but before I knew it I was crying. Here was Mama, a tremendously dangerous animal concerning herself with what all Mamas are worried about: the flourishing her children. It was the intersect of Mama's power, wildness, and tenderness that got me, as well as the playfulness and vulnerability of the cubs. We've made it so difficult for them to live yet they're surviving anyway, as precarious as that survival is.